EASY TO INSTALL--Plug and play,your brand new 120V G9 base led bulb is ready to work. The milky cap makes light softer and cozier. The ceramics housing is highly design-driven and good at heat dissipation.Say bye to hot G9 halogen bulb. It's a cost-saving item to run with only 3W of power for up to 300 lumens. Last a lot longer at a lower energy cost. Save effort and maintenance costs on changing bulbs frequently. It has a viewing angle of 360 degrees. It can be widely used in interior design for creating decorative lighting, like crystal chandelier lamp, wall lamp, pendant light. 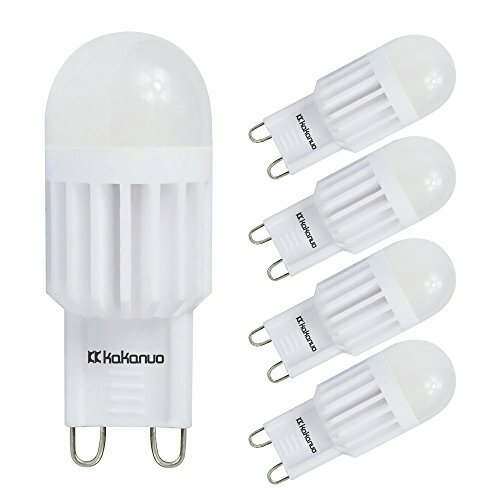 ▼Why Kakanuo G9 LED bulb? All products from Kakanuo have been tested before shipping. LED bulb as a new technology is a perfect replacement for incandescent bulb. 90 days money back guarantee and 2 years replacement warranty. Any doubts and questions, please feel free to email us. If you have any questions about this product by Kakanuo, contact us by completing and submitting the form below. If you are looking for a specif part number, please include it with your message.